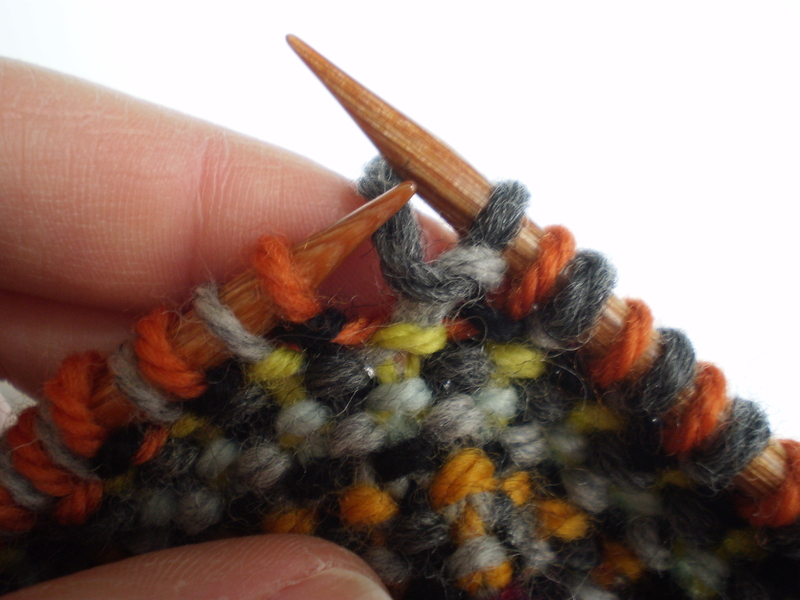 Do you ever get a bug under your skin, and suddenly, you can’t imagine anything you want to do less than work on the projects you’ve already got on your needles? I got it into my head that I wanted to do something utterly useless, and totally pretty and silly. 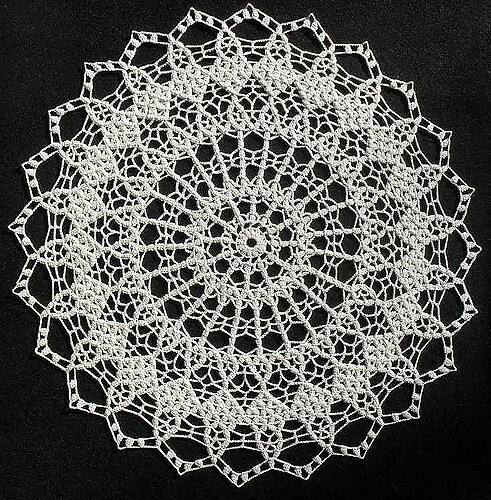 So, I thought about the supplies I had on hand, and it came to me: a doily. 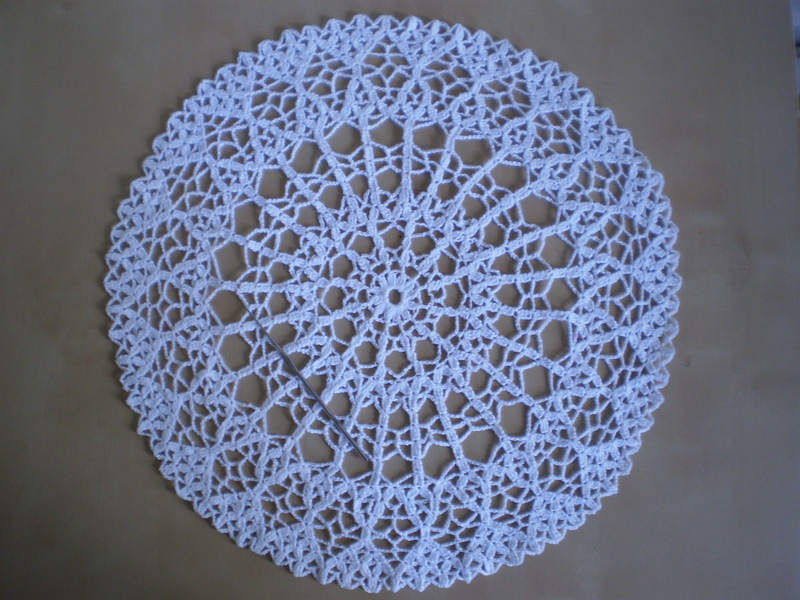 Now the question is what to do with the finished doily. I’m not really a “doily” kind of person, and my house isn’t really a “doily” kind of house. Right now, it’s hanging out on a little end table in my knitting studio, but I’m open to other suggestions! What projects have you done while avoiding stuff you “should” be doing? AND! Don’t forget to sign up for the Aura Giveaway! 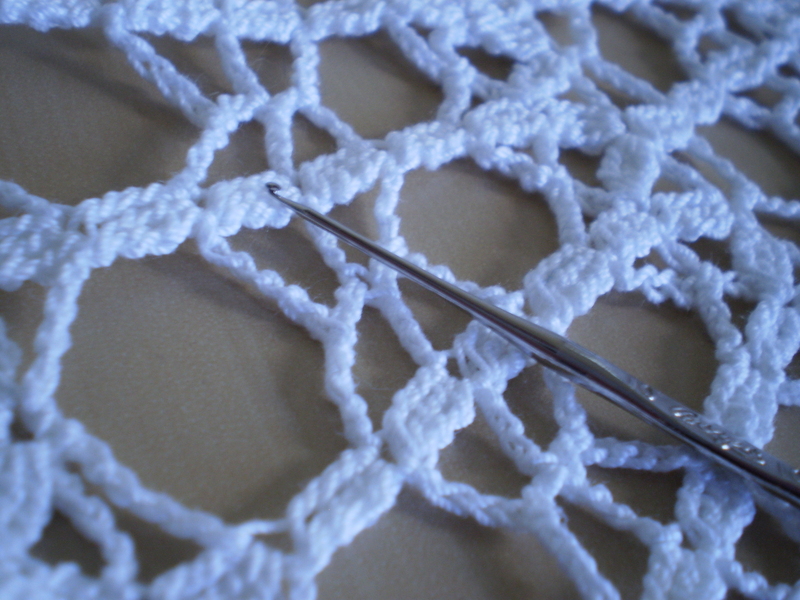 This entry was posted in On My Needles and tagged brocade, cotton, crochet, doilies, doily, starch, steel crochet hook on March 30, 2016 by onemilljellybeans. I’m thinking that my next sweater should be for me. And I think it should be more modern and girlier than my usual fare of plain-ol, top down pullovers. 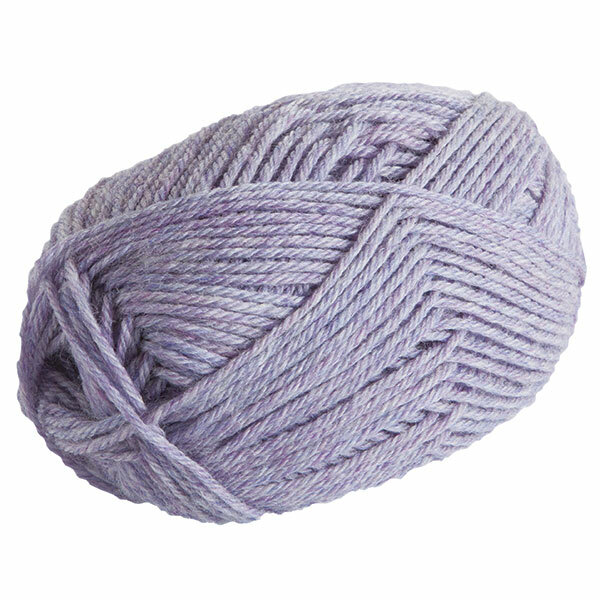 And I think it should use this lovely lilac yarn I’ve had stashed away for almost a year. (KnitPicks’ Wool of the Andes Superwash in Haze Heather) My first instinct is to go simple and easy to really show off the color. Add in an interesting, modern silhouette, and I’m in love! Maybe I want to keep it simple, but do a more classic, relaxed silhouette. And maybe add a little textural interest, just enough to make it fun. Maybe I need something a little fiddlier- something with a ton of teeny tiny cables? Oooh, look at this one! An interesting, modern shape, a perfect canvas for super-cool cables, and I think it would look pretty killer in purple! 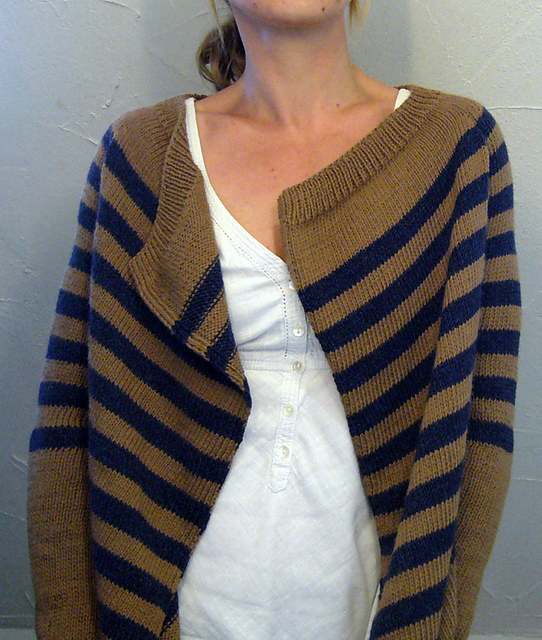 Stranger Cardigan by michiyo I think we might have a winner! This entry was posted in On My Needles and tagged cables, cardigan, On My Needles, pullover, stranger cardigan, sweater on March 28, 2016 by onemilljellybeans. What’s that? A new pattern? 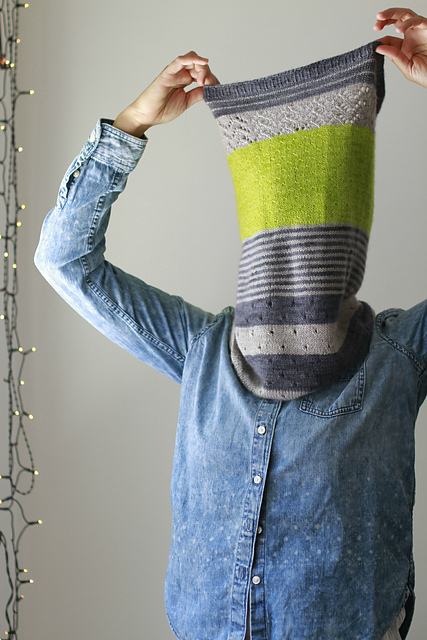 In a new KnitPicks collection? Ooh boy! This collection is just in time for spring! And it might be my most favorite collection ever! It’s dreamy, light, and feminine but somehow not too”girly.” The sky outside my studio window is blue and I can see tulips blooming in my yard. It’s all too perfect. 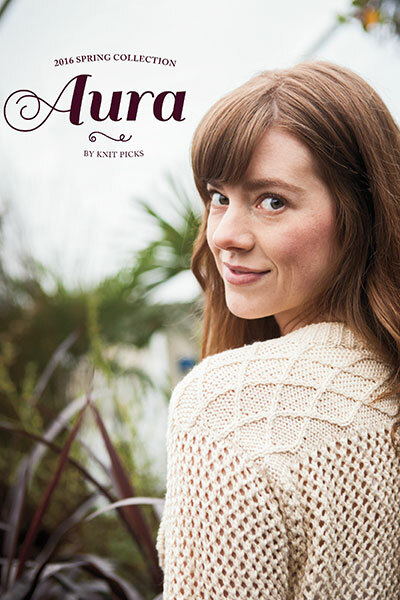 These 16 gorgeous garments is collected in KnitPick’s newest book, Aura! 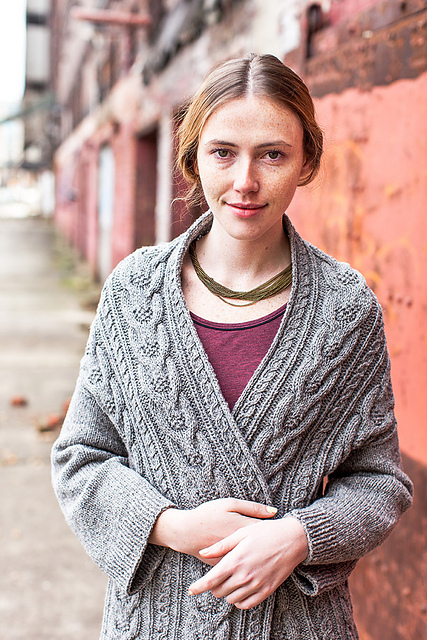 I’m loving the openwork cardigan, Solana, from the cover. And I’ve never been tempted to make a knitted t-shirt, but this Rippling Top is to die for. And I am just in love with this light-as-a-feather Muse Top. Sigh. Oh! I almost forgot to show you the pattern that I made, I’m so enchanted by the other patterns! Do you want this collection? (Yes, you do.) Comment below with your favorite Aura pattern, or your favorite springtime activity for a chance to win a copy! I’ll be holding the drawing next week! 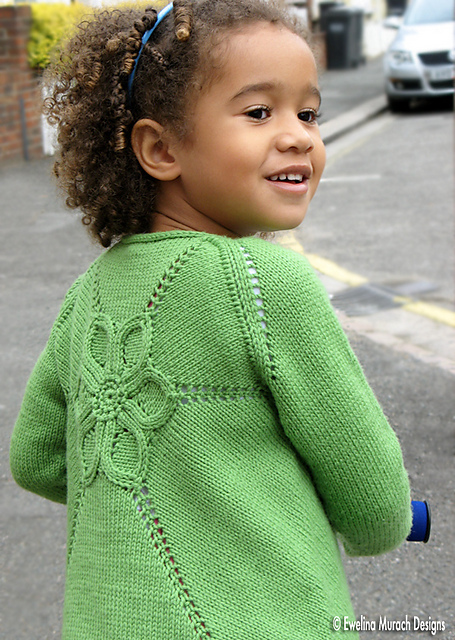 This entry was posted in Patterns and tagged aura, collection, knitpicks, knits, light, magnolia, pullover, spring, springtime on March 25, 2016 by onemilljellybeans. I love buttons, yes I do. I love buttons, yow ’bout you? Last weekend, my husband and I went on the Quest for the Perfect Button! It was actually quite fun. We started out with breakfast at our favorite brunch spot (If you’re in Seattle, be sure to visit The Dish, and get the SOB Spuds with eggs. So good! ), because everyone knows that shopping for buttons should not be done on an empty stomach. Then we wound our way back toward our house and stopping here and to look for buttons. 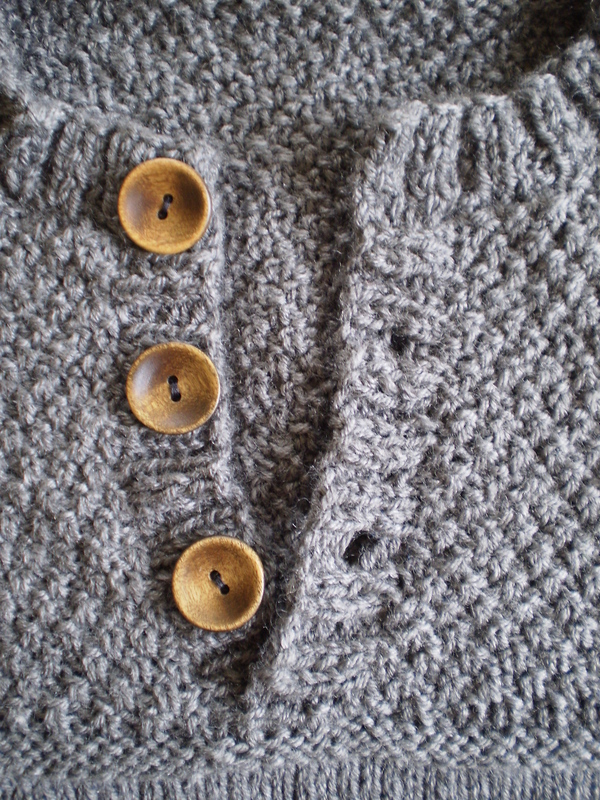 I still maintained that pewter buttons would look good, but as you guys reminded me after my last sweater post, this is my husband’s sweater, and he’s the one who is going to wear it, so we ended up finding some pretty cool wooden buttons. This scares me. I’m fairly certain that I’ll end up melting the yarn. (I don’t know why I’m certain about this- must just be some manifestation of my general anxiety.) So! If you have suggestions, tips or tricks, please let me know! I would love any advice you have for not completely messing up this sweater! 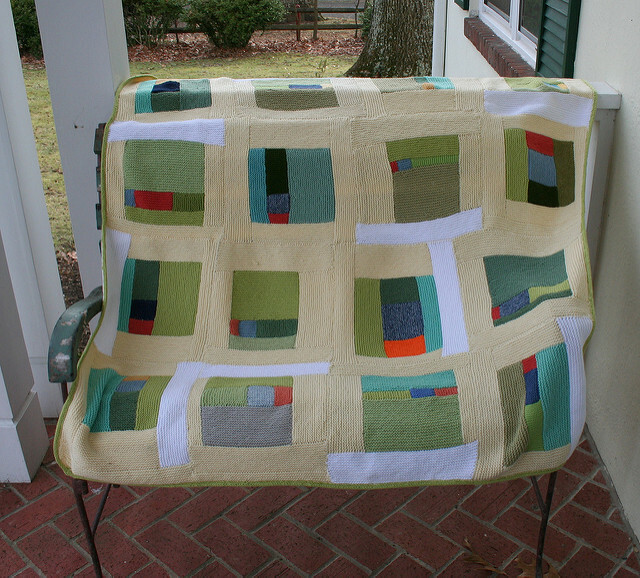 This entry was posted in On My Needles and tagged adding buttons, buttons, finishing, husband, husband sweater, wooden buttons on March 23, 2016 by onemilljellybeans. Yesterday was the equinox, so happy official spring everybody! Here in Seattle, the trees and flowers have decided to blossom with a vengeance! I swear, when I even look outside my nose starts running, and I begin to sneeze uncontrollably. Not ideal, sure, but does that stop me from picking flowers and bringing them inside? Ha! Histamines be damned! I’m going to enjoy spring! 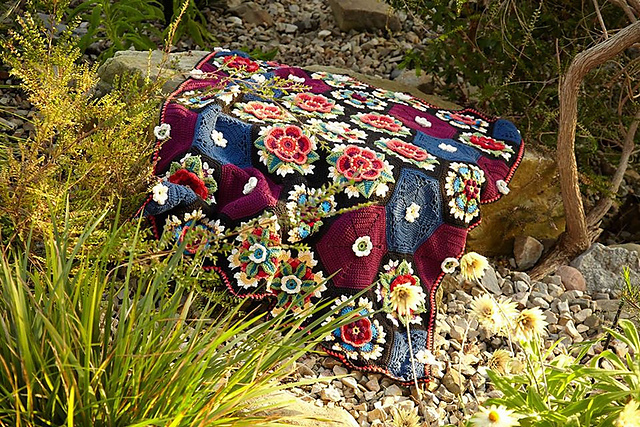 It’s not quite warm here- a damp chill in the 40s and 50s, so a lovely blanket like this, strewn with gorgeous flower motifs would be just the ticket! 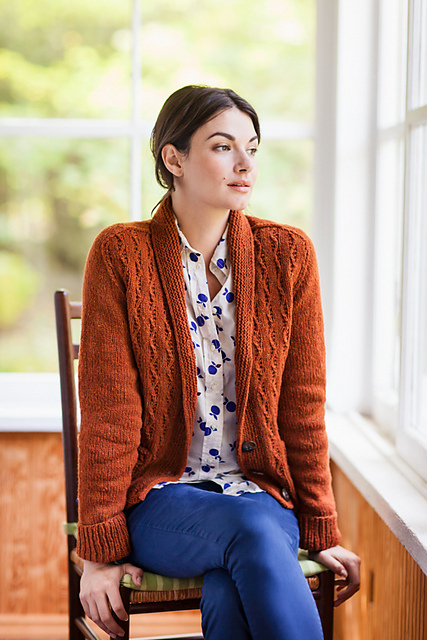 Flower Cardigan by Ewelina Murach And, I have to admit that my teapot is shockingly naked at the moment. 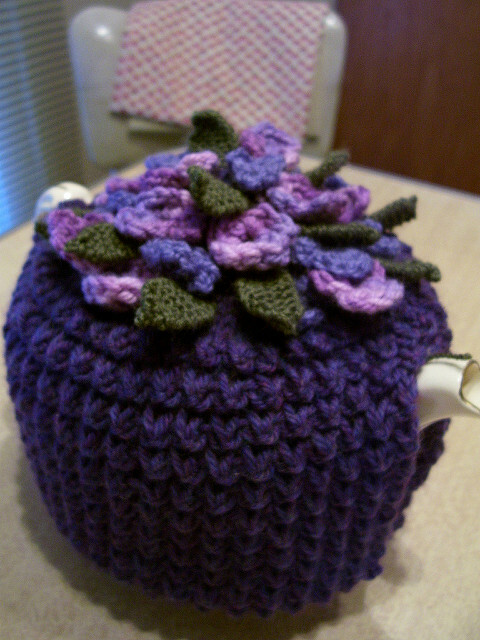 Maybe I should work up this warm-looking tea cozy strewn with adorable little violets and leaves. What’s the flower situation like in your neck of the woods? Have your daffodils come up yet, or your cherry trees blossomed? This entry was posted in Inspiration and tagged allergies, blanket, cardigan, floral, flowers, knit, spring, sweater, tea cosy, tea cozy on March 21, 2016 by onemilljellybeans. 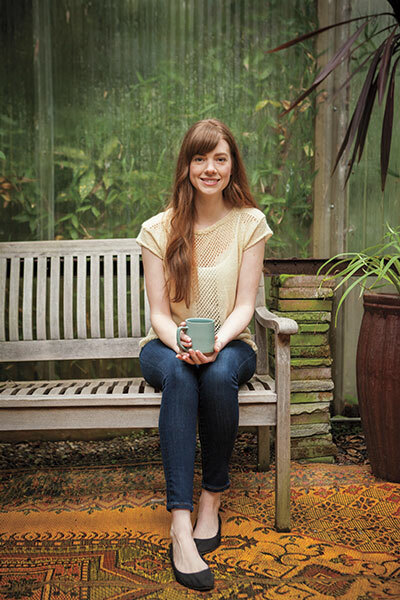 Hi knitters! It’s been a while since I’ve checked in with you, so I think it’s about time! I want to know what you guys are into! What are you interested in? What do you want to see? Do you want tutorials? Knitalongs? 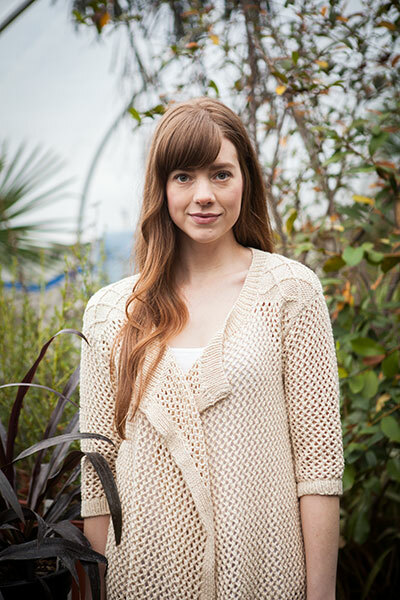 Pattern and yarn reviews? Do you want more ramblings about how bad I am at technology? (Too bad- you’re getting those regardless!) Do you want recommendations for media to entertain you while knitting? Do you want to see more of the projects on my needles? Do you want to share your projects? The sky’s the limit! Just let me know what you’re interested in, and I’m happy to provide! 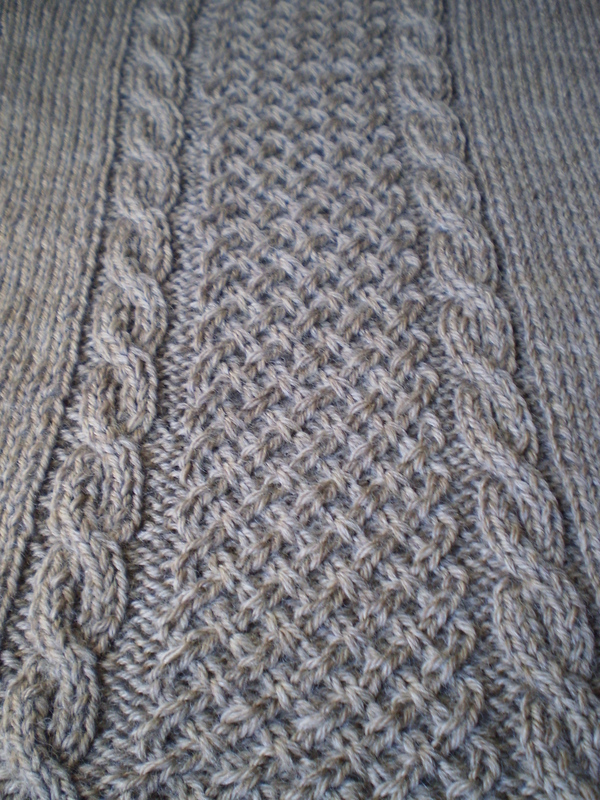 This entry was posted in About the Blog and tagged audience suggestion, knitting, request, requests, suggestion, tutorials on March 18, 2016 by onemilljellybeans. This Sunday we were attacked by the biggest wind storm I’ve seen since I moved here 5 years ago- maybe ever (which is saying something, coming from Illinois, where gales of wind rip across the state, since there’s nothing taller than a stalk of corn to stop them). Trees were torn up, power lines were downed, they even had to close the 520 bridge because the waves on Lake Washington were so big, they were splashing up onto the bridge and causing dangerous conditions. Our neighborhood lost power at about 2:00 in the afternoon. And we didn’t get it back until the middle of the night- almost 12 hours later. We didn’t feel safe driving anywhere, since the roads were littered with debris, and we didn’t want to leave the house, in case something went wrong (our house is surrounded by very big, very old trees- charming in sunny weather, scary in a wind storm). So, we stayed in and watched the neighbor’s 3-story-tall pine trees whip back and forth like blades of grass. It was kind of terrifying, but also really cool. So, what did we do for 12 hours of powerlessness? We played cards, listened to the music on our phones (until the batteries got too low), read books, and (of course) knit. I would start with something super fiddly and technical. 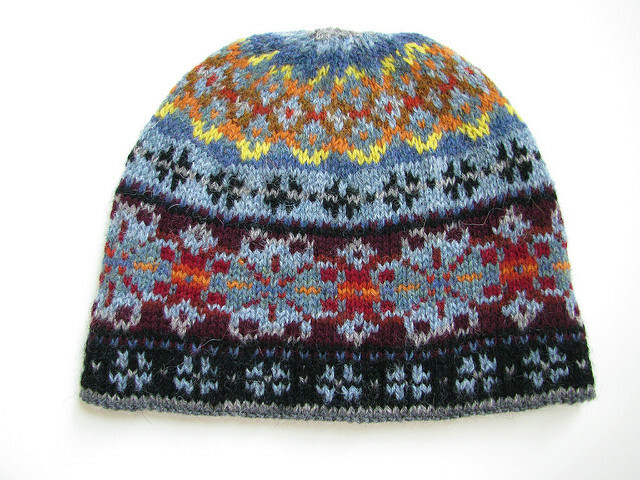 After all, with no TV to distract me, I could really throw myself into a pattern like this gorgeous (and futzy) Fair Isle hat. Electric Snow Fair Isle Hat by Don Godec Then, when the sun started to go down, I would switch over to a pattern that used super bulky yarn. 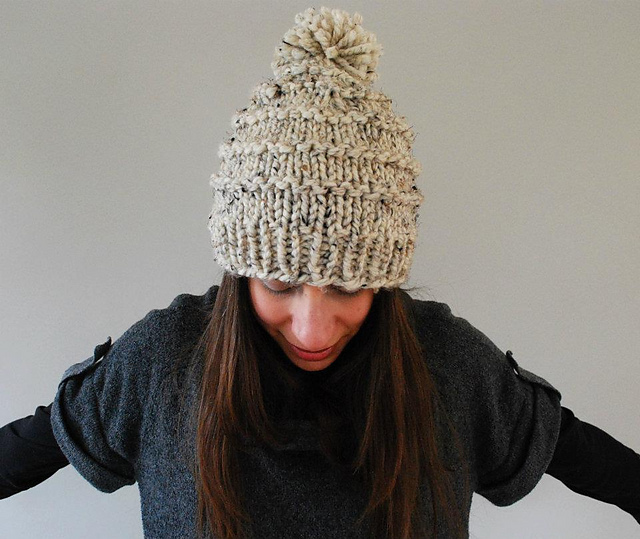 With lowered visibility, big yarn is a must, and this hat’s simple design would be perfect for knitting in the dark. Have you ever tried to knit by candlelight? It’s not easy. Trust me. And, of course, no power means no heat (at least in my house). So I would need as many blankets as possible! 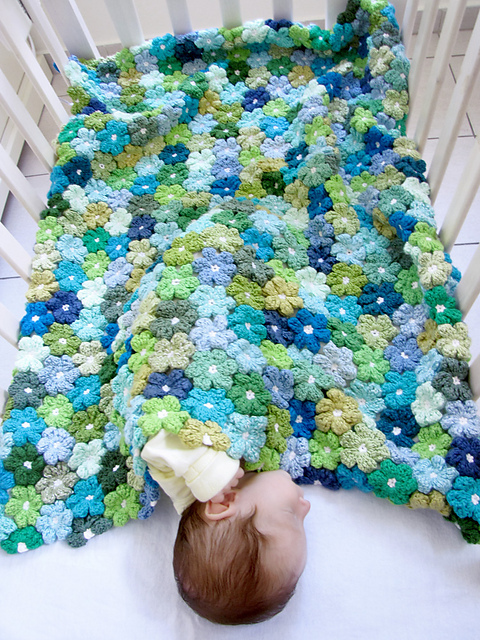 This garter-stitch one would be perfect- squishy and warm! Luckily our power’s back on now and we’re all back to normal (though it still feels luxurious every time I can open the fridge without worrying about the food spoiling). But next time, I’ll be prepared! Have you ever had a blackout in your neighborhood? What did you do to keep yourself busy? This entry was posted in Uncategorized and tagged blackout, blanket, bulky, disaster preparedness, fair isle, garter stitch, hat, storm, wind on March 16, 2016 by onemilljellybeans. I’ve finished my husband’s sweater! Woo! It’s got a collar and a body, and two arms that end in nicely finished cuffs. I really am quite pleased with how this sweater has turned out. I like the moss stitch yoke, and it actually fits my husband pretty well. Not bad for a quick, semi-improvised sweater project! It need buttons. I’m thinking pewter, but my husband is campaigning for wood. What do you think? I think it’s still a half-inch too short. (Even after ripping it back and re-knitting the waist. I think it might have some sort of curse.) 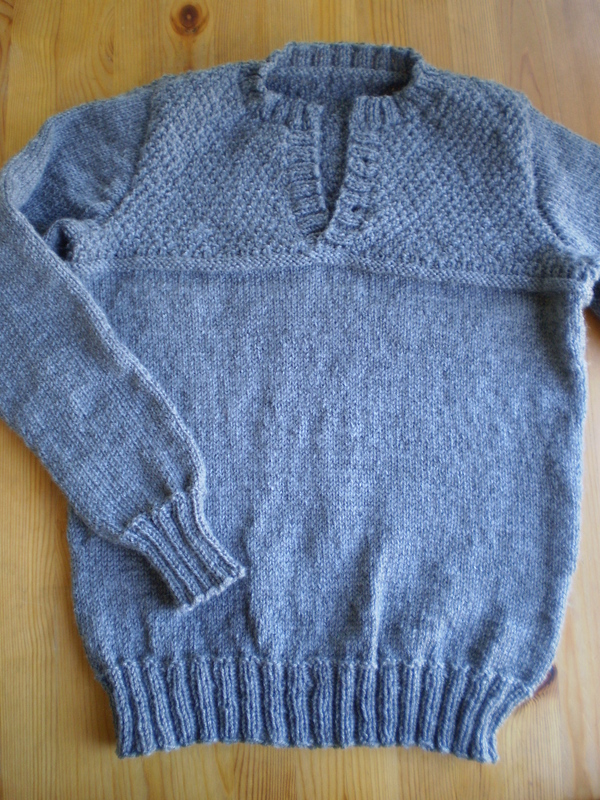 I’m going to try steam-blocking it, in the hopes that I can avoid re-knitting the hem for a third time. Wish me luck! Not bad, if I say so myself. 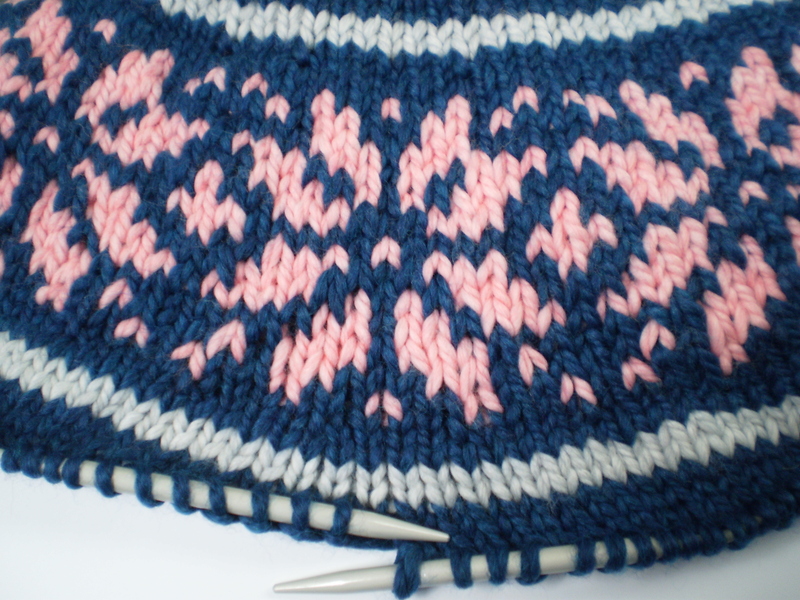 This entry was posted in On My Needles and tagged henely, husband, husband sweater, men's, men's sweater, pullover, sweater on March 14, 2016 by onemilljellybeans. 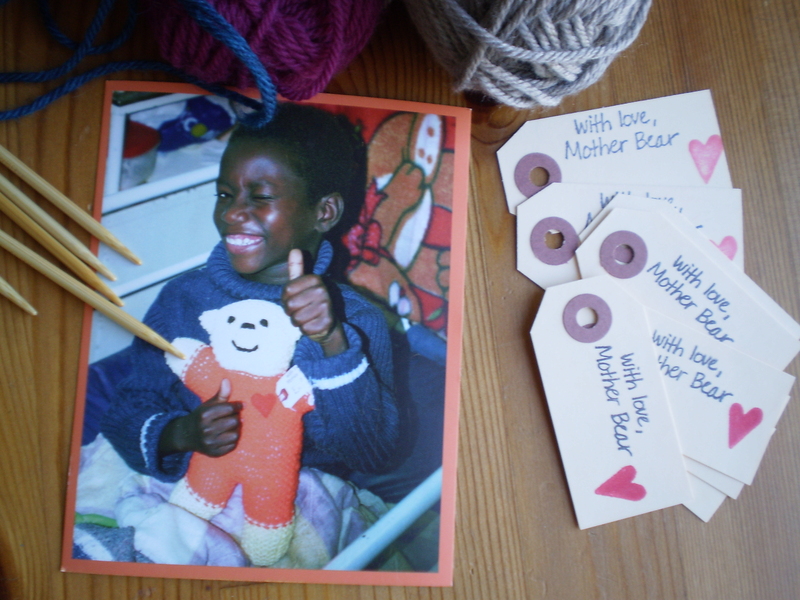 If you remember, I spent my holiday season knitting up a bunch of teddy bears for the Mother Bear Project (an amazing organization that sends hand-made teddy bears to children in emerging nations whose lives have been affected by HIV/AIDS). 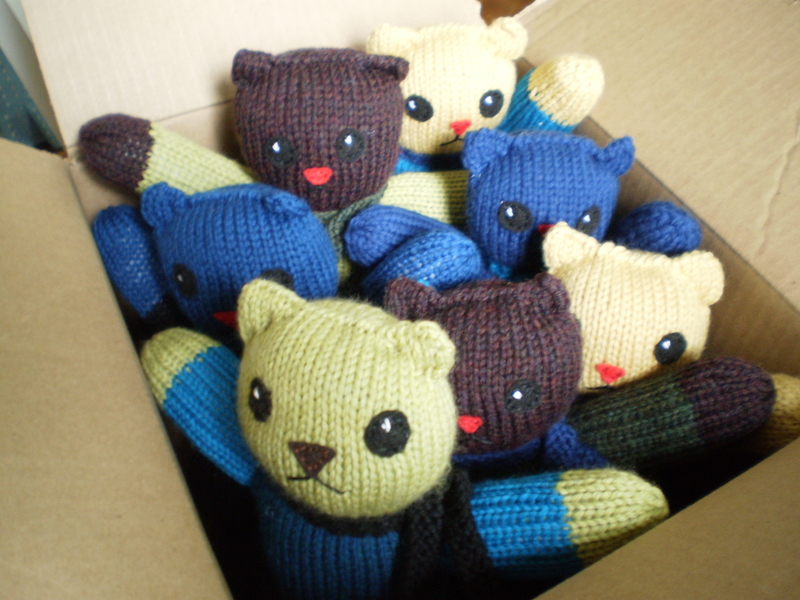 I ended up with seven bears, made from super soft leftover yarn, that I sent of to Mother Bear Headquarters in Minnesota. Then, a few weeks after the holidays, I received a beautiful hand-written thank-you note from the Mother Bear herself. And, included in the note was a stack of little tags to be tied onto more bears. And you know I can’t say no to a challenge (especially when it’s for such a good cause). So, in-between design work, sweater knitting, and breaking my keyboard, I’ve made a little time to start up my bear-making machine again. They’re perfect “in-between projects.” Small and simple enough to be a pretty quick knit, but interesting enough (with all their color changes), to hold your attention. I’ve collected all the little half-skeins of yarn of the same type (in this case, I’ve found a bunch of KnitPick’s Wool of the Andes Worsted, leftover from a few sweater projects), and put it in a bag with the right size needles and the pattern. That way, everything I need will be ready for me whenever I feel the urge to get a little bear-y. 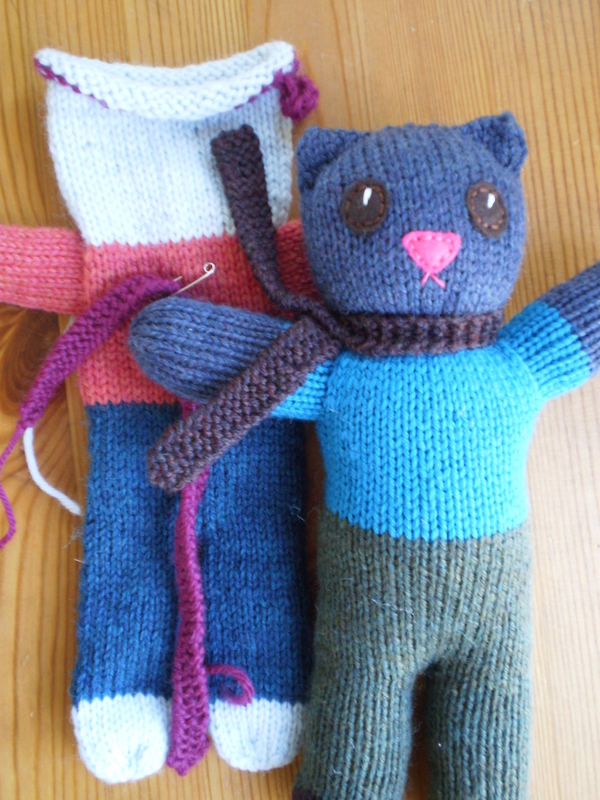 I’ve already made one-and-a-half more bears! I wonder how many bears I’ll be able to knit like this before the end of the year. This entry was posted in Knitalong and tagged bear, charity knitting, knit, mother bear project, teddy bear on March 11, 2016 by onemilljellybeans. And do you know what was the first thing I did? I broke one of my keys. I bet you will be able to figure it out- it’s a letter that I haven’t typed in this entire post (other than the pattern names), and it’s a letter that is useful when talking about knitwear. Hint 1: It’s the first letter of this lovely knit garment- a loose and lovely sweater split down the front (it’s not a pullover, it’s a ________). 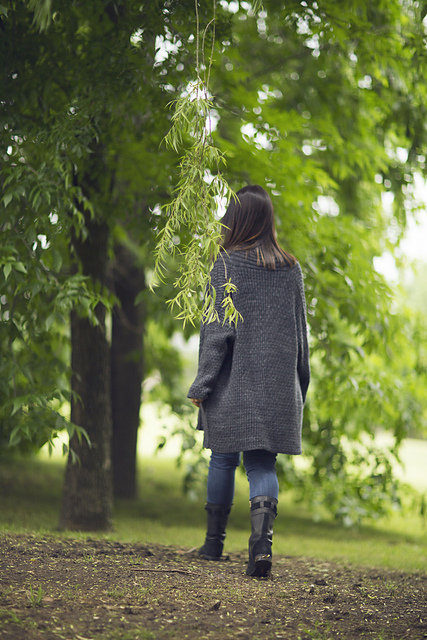 caramel by Isabell Kraemer Hint 2: This final outerwear layer isn’t a sweater, it’s a big, bulky __________. Big Old Coat by Joji Locatelli Hint 3: And this bright and happy tube of knitting isn’t a shawl or a wrap, it’s a ________. 3 Color Cashmere Cowl by Joji Locatelli Did you figure out what letter is missing from my keyboard? It’s the one that follows B in the alphabet. It also turns out to be a very useful letter when talking about shades and hues of yarn (_olors) and various knitted garments (_ardigans, _oats, and _owls). Sigh. Unfortunately, without this letter, if I work up any of these patterns I won’t be able to write about them on my blog! Oh no! 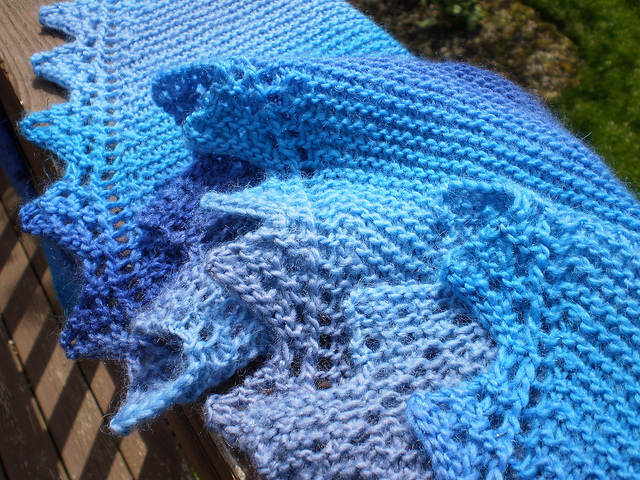 This entry was posted in Inspiration and tagged c, cardigan, coat, cowl, keyboard, knitting, laptop, letter, sea on March 9, 2016 by onemilljellybeans.